Ever seen an elephant fly? well now you can! In fact, you can even pilot one! 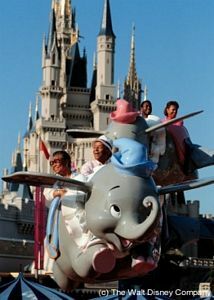 Soaring into the Fantasyland sky is none other than 'Dumbo', one of Walt Disney World's most recognisable attractions. Under the watchful gaze of Timothy Mouse, take Dumbo as high or as low as you like before gliding back to earth for a safe landing. A great adventure for young children! Best time to visit: A favourite with children. Visit before 10:30am or a few hours before park closing. If you have young kids in tow, it's a good idea to make Dumbo one of your first stops as crowds do tend to build as the day goes on. Much like Tomorrowland's 'Astro Orbiter' it'll be a tight squeeze for more than two people (per elephant) and comfort could be an issue for larger guests. 'Dumbo' was one of several opening day attractions to feature at the Magic Kingdom back in Oct 1971. Each Disney theme park around the world has there own 'Dumbo' attraction. There are 16 'Dumbos' for guests to climb aboard. Dumbo was relocated and doubled in size as part of the 2012 New Fantasyland expansion.